Now 1.5 (year and a half) into ownership our Dodge Avenger starts leaking oil (just couple spots) and suddenly overheats (on way to job interview). We again call Ford's Service dept to make appointment we were told "We had to take it to Dodge for service." Again we take it to Towbin Dodge. Right away Towbin Dodge's service personal (Mary) start telling us "they have determine we didn't abuse the car." Because our warranty wont' cover abuse. But, was told by warranty company "this should be covered under warranty as it's part of the cooling system". We feel offended at the suggestion of 'abuse', and go to talk to Ford Country's Finance Manager (Scott Gilmore) who tells us to approve the tear down to move the claim forward under the warranty "The only suggestion of abuse is if we used the car for street racing or didn't do maintenance." Neither was the case! The day after we drop car off we're told "We have to AGREE pay $1,200 to tear down the motor to determine the problem." The car has only been driven to and from work. Less the 9,000 miles in a year and a half. We call Ford ESP directly and told "Cooling system is covered under warranty." Imagine our surprise when Mary (New Employee) at Towbin Dodge calls and says "FORDS ESP Declined Repair claiming part (Oil Cooler) not covered. Even though our warranty covers "(Engine) All Internally Lubricated Parts." Upset...we go back to Ford Country and talk to sales manager (Kevin Vanetta) explaining our issues and how (Scott Gilmore) assured us FORD would get involved with enforcing warranty if repair was declined because, (as discussed) we were never offered any optional ESP warranties at time of purchase. Sales Manager Vanetta states "if we had contacted HIM personally when we starting having issues, he could have had Ford's Service Mechanic's do the work." We were continuously told take it to Dodge! We contact Ford ESP warranty again. Requesting supervisor Craig send an inspector out to look at car. We're told it would happen within 24 to 48 hours. We go back to Towbin Dodge and ask to talk to the Mechanic doing the work, Kris (Certified Mechanic) tells us on October 11, 2017 (ON RECORD) "Tell the warranty company the oil cooler, oil filter adapter housing / oil cooler is A) internally lubricated, where the oil flows in and flows out for the oil filter and oil system. B) If the Cooling System is covered IT IS part of the cooling system". Kris continues "It has the exact same coolant that flows through it, that flows through the rest of the engine. It is not isolated from any part of the cooling system. They are both integral to the cooling system and the oiling system. So those are some the points he would make to the inspector." It falls under engine / powertrane. On Friday, October 13th Mary at Towbin Dodge calls and says inspector for "FORDS ESP Declined Repair still declining claim. They will not pay for Oil Cooler part and the cost of repair is $7,777." We're distressed to put it lightly. We're paying $2,300 on a FORD ESP 3 year Warranty (still good for 2 years) and 4.5 more years of car payments on a car financed through Capitol One and torn apart at Towbin Dodge. When we insist that FORD COUNTRY (representing FORD's ESP) must have connections to they're warranty company when (sales mgr) Kevin says "We're not Ford" this is and private company, Family owned by Mr. Ackerman that leases space to sell Ford product's, warrantees and service." It's tough luck for us but, still wants to try selling us a new Ford car but, says clearly we can't take our car in, as a trade in. Been back to Towbin Dodge everyday talking to Service Manger Abraham who encouraged us to convince warranty people to re-inspect vehicle as mechanic offers to rewrite repairs to include head gasket / oil pump failed. Following day we stop by to drop off Diag Report from Sept 2017 AutoZone showing Dual stage oil pump stuck in low / off position. When check engine light came on indicating Battery low voltage and we had replaced. Abraham informs that inspector already came out & took pictures "Doesn't tell us (Abraham) anything?" Really is this wow it works? Today October, 19, 2017 Mary texts repair work declined again. Warranty people inform us this is final we have no other recourse! How does FORD COUNTRY sell used cars under they're warranty and then claim we're not FORD? 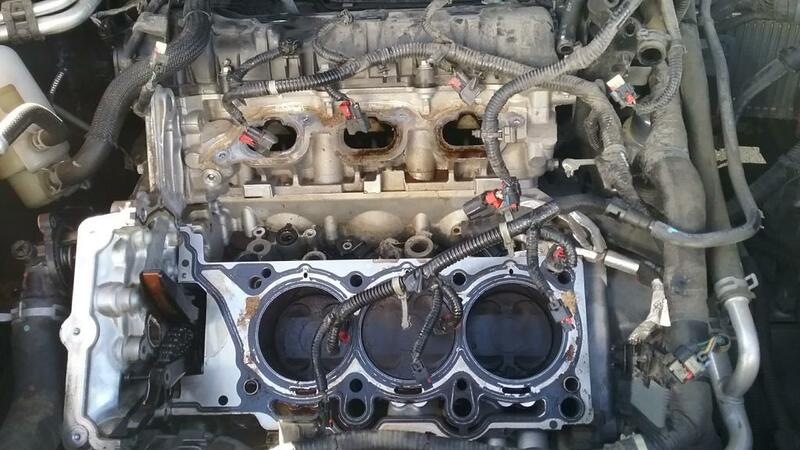 Why do they tear down the hole engine to determine Oil Assembly failed? How does Towbin Dodge not stand behind stated work by they're own mechanic? What do we do with a car torn down and sitting at Towbin Dodge? Bought 'used' through a dealership with a warranty specifically so we didn't get stuck with pre-owned problems from private party. Need Help! We're seniors being taken advantage of. Feels like Towbin is legalizing stealing car from customers!